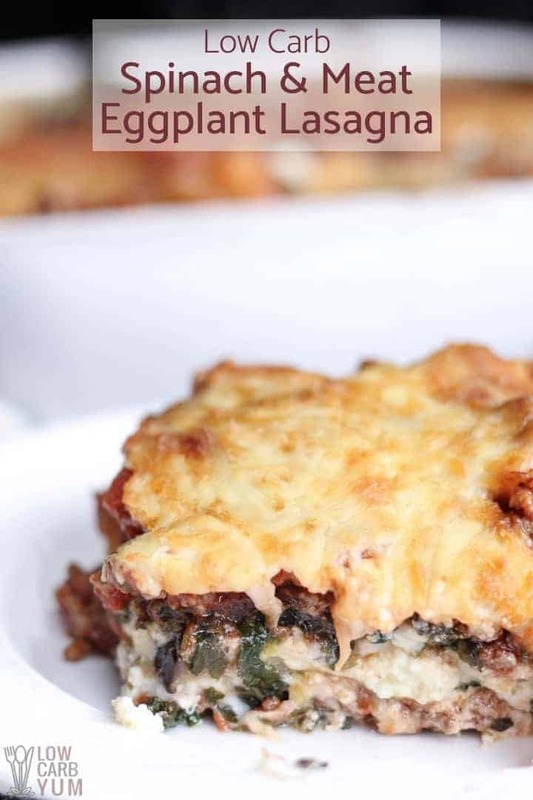 A delicious no noodle spinach and meat lasagna to make for a simple dinner. Eggplant is used instead of the noodles and healthy spinach is added. 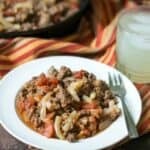 Last week, I was looking to make a low carb casserole that would provide a weeks worth of lunch and possibly a few dinners. I also wanted to use up a few late season eggplants from the garden and some ricotta cheese I picked up at the grocery store that week. It has been a while since I made a lasagna without noodles and I knew that it would make enough to feed me for a while. Since I’ve been working extended hours at work, I haven’t had a lot of time for cooking. 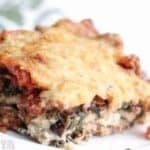 This spinach and meat lasagna was a perfect dish to keep me full during those long days. 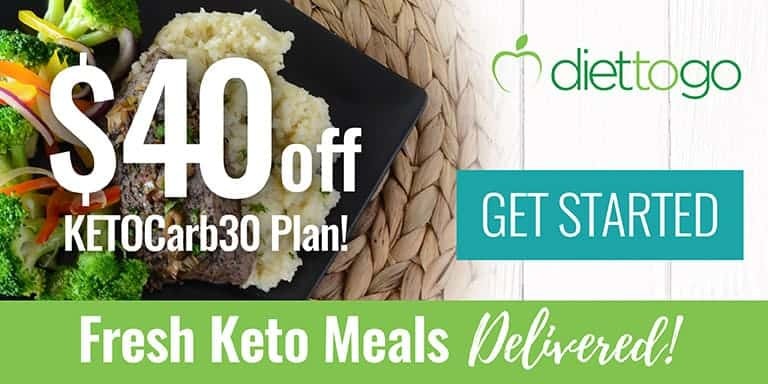 All I had to do was reheat in a single serving for a yummy quick and easy meal. 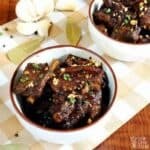 I based this recipe on one from a Better Homes and Gardens cookbook that I’ve been making for years. The main changes I made was replacing the noodles with eggplant and adding in spinach. 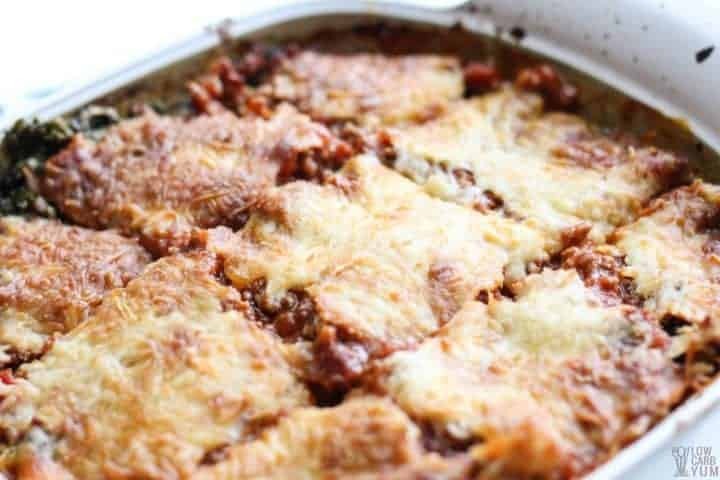 The no pasta lasagna can be made with or without eggplant. However, using the vegetable slices in place of regular noodles helps hold the casserole together. If you don’t like eggplant, zucchini is a great substitute to use. In either case, I find it best to salt the thin vegetable slices to help release water before cooking. 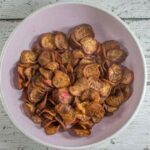 The vegetable slices are then roasted in the oven, or fried until soft and golden. If baking, it takes about 25 minutes, turning each slice halfway through. To fry, just cook each side until browned. Next, the ground meat is cooked in a skillet with garlic and the excess liquid is drained (photo 1). Then canned tomatoes, tomato sauce, and tomato paste are added (photos 2 & 3). 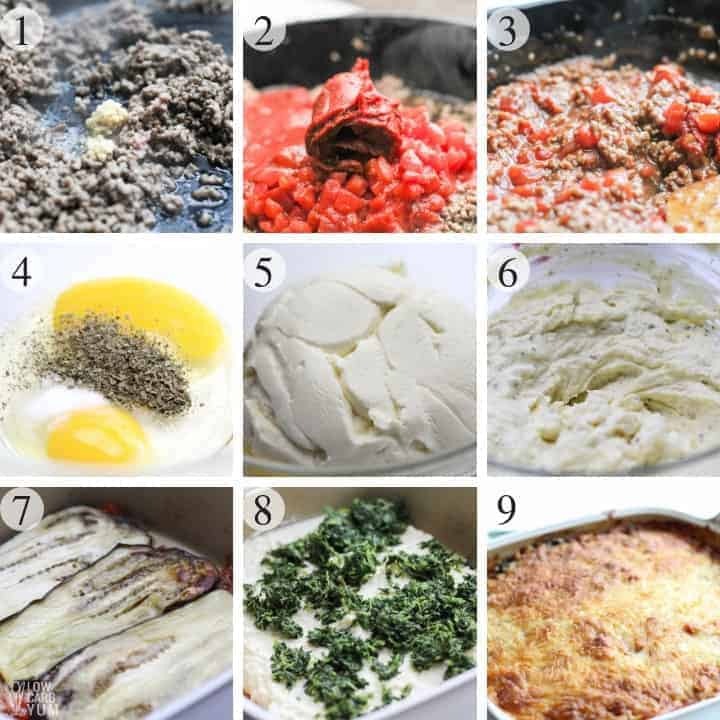 While the meat is cooking, the cheese layer can be prepared by mixing eggs, spices, ricotta cheese, and parmesan cheese together (photos 4-6). The first layer is a little bit of sauce placed at the bottom of a 9×13-inch casserole pan. Then, the vegetable slice layer is added (photo 7) if using which is then topped with half the ricotta cheese, half the spinach, and half the meat sauce (photo 8). The layers are then repeated. It takes about 30 minutes to bake the lasagna in a 400°F until browned. The pan is then removed from the oven and cooled slightly before slicing (photo 9). 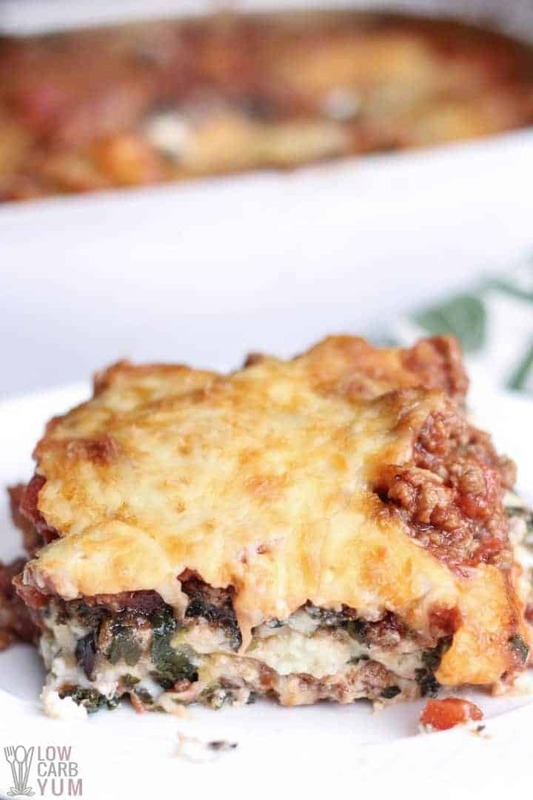 I like the addition of more vegetables in this spinach and meat lasagna without noodles. 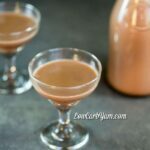 It’s a yummy way to make get your daily intake of veggies in. And, I’m always looking for ways to get everything in with one dish. It’s much easier than making a main dish and side. 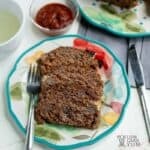 You can even leave out the meat layer if you want a meatless dinner. 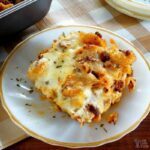 Any cheese lover will appreciate this cheesy casserole dish. I’m a fan of ricotta cheese, but for those who prefer cottage cheese in lasagna, feel free to change it up. 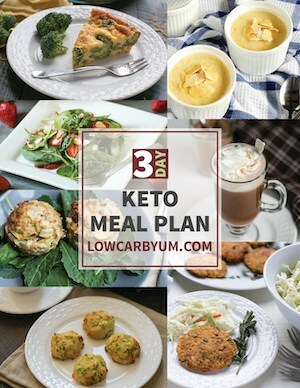 I have a few other great low carb lasagna recipes on the site. 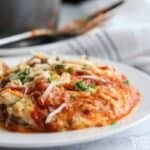 You can chow down on a pumpkin lasagna, a skillet lasagna, a spaghetti squash lasagna, or a super simple Instant Pot lasagna! 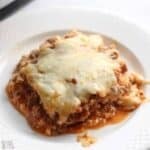 There’s even a crock pot lasagna recipe I found here. 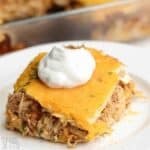 Do you have a favorite low carb lasagna recipe? 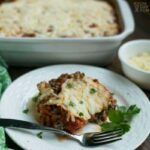 I hope you enjoy this low carb lasagna recipe as much as I did. It’s plenty to feed a large family. If you aren’t feeding a large number of people, you can always half the recipe. Another option is to eat half and freeze the other half for later. A delicious no noodle spinach meat lasagna to make at home. Low carb eggplant replaces the noodles and healthy spinach is added.